ZNI staff begins searching for work placement after receiving all applications documents. On average, the work placements for incoming candidates are found within 1 week (and even sooner if it is necessary). Therefore, at ZNI we developed a special, innovative approach to activities BEFORE candidates start with the work placement. During the preparation period the participants familiarise themselves with the wider meaning and purpose of the EU programmes of mobility. As part of personal and work preparations they are given advice and instructions on what is expected by employers on today’s labour market: what are the must-have job skills, personal attitude and expected approach to work. Moreover, during personal preparations the participants are involved in personal presentation and interview simulation training with purpose to learn how to provide relevant information about themselves and how to leave best impression on potential employers. In other words, participants are thought how to benefit from their mobility experience and increase their employability in near future. 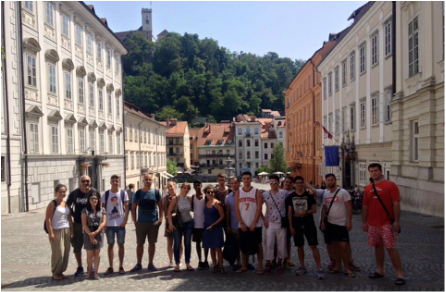 As an important part of the preparation period for candidates, we organise English language programs where also the basic Slovenian phrases for communication and integration in the community are learnt. Moreover, all the participants are involved in cultural activities and trips in order to discover and familiarise themselves with the historical and cultural heritage of the region. We organise visits to museums, theatres, medieval castles, towns of historical and modern significance as well as nature tours such as hiking and skiing or sledging. DURING the work placement each incoming candidate is assigned a mentor from ZNI, who provides professional and moral support and monitors the candidate’s progress. Mentoring meetings take place every two weeks. The participants are requested to write weekly reports in which they express their thoughts, encounters and any significant experience they have made. At the END of the mobility program an evaluation meeting is held with the objective to reflect on the experience and recognise its benefits as well as to assess the program itself. ZNI offers guidance and support to every individual through all the phases (stages) of the program and ensures that all the objectives of the program are met. Issuing certificates, airport and local transfers, 24 hours support. For more information on our Hosting Projects click here.